Attach to W3WP so you never need to open the Attach To Process dialog. 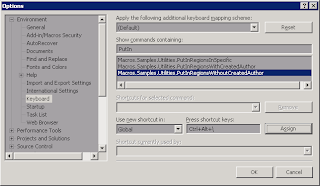 Note that the macro is trying to attach to the first w3wp.exe process that is runs under your credentials. If you call the function again, it will attach to the next w3wp available, as sometimes you might have more than just one. Of course if it doesn't find a w3wp.exe running under your account, it will attach to the first that it finds. Note that calling the function multiple times, will attach to the next available IE.exe process. For an easier use of these macros I suggest you should map your custom shortcuts - I am using alt+3 and alt+4 for these. What about when is not your code @-) , isn't hard to look after the fields, methods, properties etc. as they are not in the right order you are used with? Here is a tool which can help you tracking and arranging the the code. It is weird aligned and it is not commented at all. 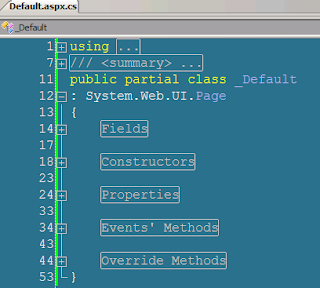 Other classes, delegates, structs etc. In the left image the code is messed up in a random order, hard to follow. Of course this is just a small example, but on real code it gets very messy. Well, that's about to be changed. As you can notice the code is nicely arranged and well commented. To change the specific name locate the CommentWholeCodeSpecific method in the macros editor and fill in your desired name. Sometimes VisualStudio goes crazy and shows up an error. 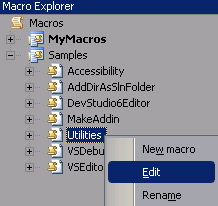 To get around it just open the File Search dialog (Ctrl+F) and do a dummy search and run the macros again. The error should be gone. Monday, 6 July 2009, Laurentiu Macovei: This has been fixed and should work smoothly. Also tested on VS2010 and works. The comment/put in regions operations can be undone by pressing Undo on your document so your document is safe. The comment feature is intended to be used very often, by all the developers with no exceptions. Basically every time when you add a new method, property, etc. 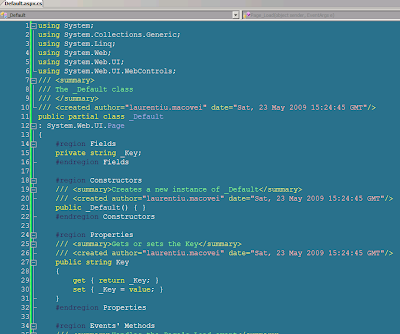 you should run the CommentWholeCode macro (Ctrl+Alt+/) so it will be commented with your username. Otherwise, some other developer may 'take' your code under his username, and that's not desired. Sorry, but doesn't every decent VCS out there support finding out who changed what and when, and in a much finer grained manner than this? Ya, but you don't always have the code in the same VCS. I use this in parallel with the SVN comments and find it very useful over the years. Speaking so, it's very hard to see in 1000 revisions who did that particular method. 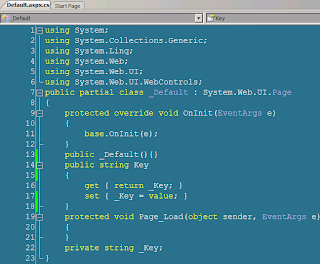 Works smoothly in VS 2008. Is there any plan to upgrade it to VS 2010 Beta 1 ? I'm installing it right now ! Just make sure you open the find dialog first and do some dummy search (the old VS bug still happens on vs2010) so no error "Value does not fall within the the expected range". Anyways, I have fixed this bug so just make sure you are using the latest version of the macro again.